Project Debater gets its knowledge from hundreds of millions of journal articles, but humans still have one key advantage. SAN FRANCISCO — The human brain may be the ultimate super computer, but artificial intelligence is catching up so fast that it can now hold a substantive debate with a human. 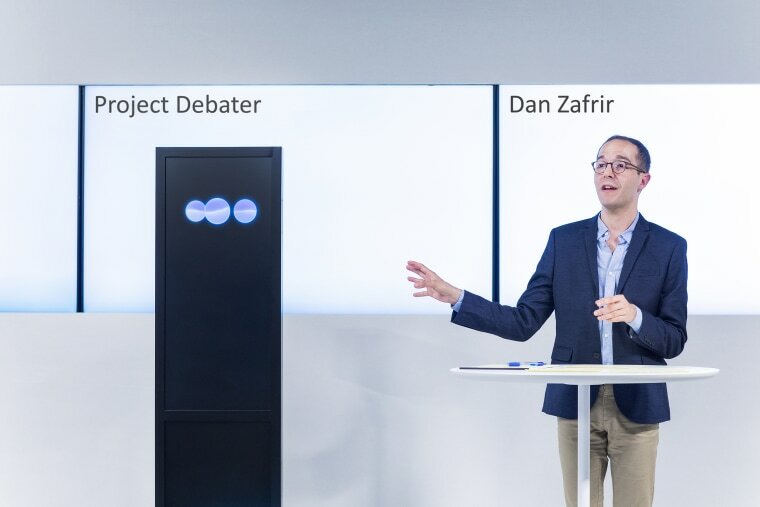 IBM’s Project Debater made its public debut in San Francisco Monday afternoon, where it squared off against Noa Ovadia, the 2016 Israeli debate champion, and in a second debate against Dan Zafrir, a nationally renowned debater in Israel. The new AI system is the latest grand challenge from IBM, which previously created Deep Blue, the program that beat chess champion Garry Kasparov, and Watson, which bested humans on the game show Jeopardy. In its first public outing, Project Debater turned out to be a formidable opponent, scanning the hundreds of millions of newspaper and journal articles in its memory to quickly synthesize an argument on a topic and position it was assigned on the spot. The skinny, black, rectangular screen stands about five and a half feet tall, putting it around the same height as a human opponent. “Project Debater could be the ultimate fact-based sounding board without the bias that often comes from humans,” said Arvind Krishna, director of IBM Research. An audience survey taken before and after each debate found that Project Debater better enriched the audience’s knowledge as it argued in favor of subsidies for space exploration and in favor of telemedicine, but that the human debaters did a better job delivering their speeches. This comes from Project Debater’s ability to “dive into a lot of data very quickly and gather information and numbers we don’t have access to quickly,” said Ranit Aharonov, manager of the Project Debater team in Haifa, Israel. Project Debater looks for sentences and clauses in journals that are relevant to the topic and determines what the potential clashes could be around the topic, according to Aharonov. It then listens and thinks — an act illustrated by three dancing circles on its screen — before it prepares to deliver its counterpoints. The AI isn’t trained on topics — it’s trained on the art of debate. For the most part, Project Debater spoke in natural language, choosing the same words and sentence structures as a native English speaker. It even dropped the odd joke, but with the expected robotic delivery. When arguing in support of telemedicine, Project Debater said: “I can’t say it makes my blood boil because I have no blood,” and then launched into a passionate defense of technological advances. Will artificial intelligence take human jobs? Both debates followed the same format. The audience voted on their stance before and after the debate, so IBM could measure how Project Debater fared against its human opponents. After Project Debater was assigned its topic and stance, it launched into a four-minute opening speech. It then listened and processed its opponent’s opening remarks, taking two minutes to think before it delivered its rebuttal. Both sides then delivered closing remarks to summarize their positions before the audience vote. IBM's engineers know the AI isn’t perfect. Just like humans, it makes mistakes and at times, repeats itself. However, the company believes it could have a broad impact in the future as people now have to be more skeptical as they sort out fact and fiction.